Mansion Casino was created in 2004 and is a popular online casino that caters to players all over the world. The site is operated internationally, by ONISAC Ltd – a well-established online gambling company based in Gibraltar. Mansion Casino holds licenses from the UK’s Gambling Commission and the Maltese Gaming Authority. There’s a huge number of games available at the casino, from gambling giant Playtech, along with some of Blueprint Gaming catalogue as well. In this Mansion Casino review, we’re going to take a look at precisely what the site has to offer so that you can make an informed decision as to whether or not to join. Claim a 100% first deposit match bonus up to R50,000. Deposit R2,500 and play with R5,000. Mansion Casino offers all new players a generous welcome bonus. Once you’ve signed up and confirmed your email address, on your first deposit, you’ll be able to claim a 100% matched deposit bonus, up to a maximum of $5,000/R50,000. For a matched deposit bonus, it’s fair to say it’s one of the most generous we’ve seen in quite some time, and it’s particularly well-suited to those looking to maximise the bonus amount they receive from the casino. The standard site-wide terms and conditions apply (as you would expect), and there are wagering requirements (which vary dependant on the game you’re playing), as well as maximum bet rules. Always make sure you have a full read of the bonus terms so that you avoid falling foul of breaching any terms. Mansion Casino’s game range is built up – primarily – from Playtech titles. 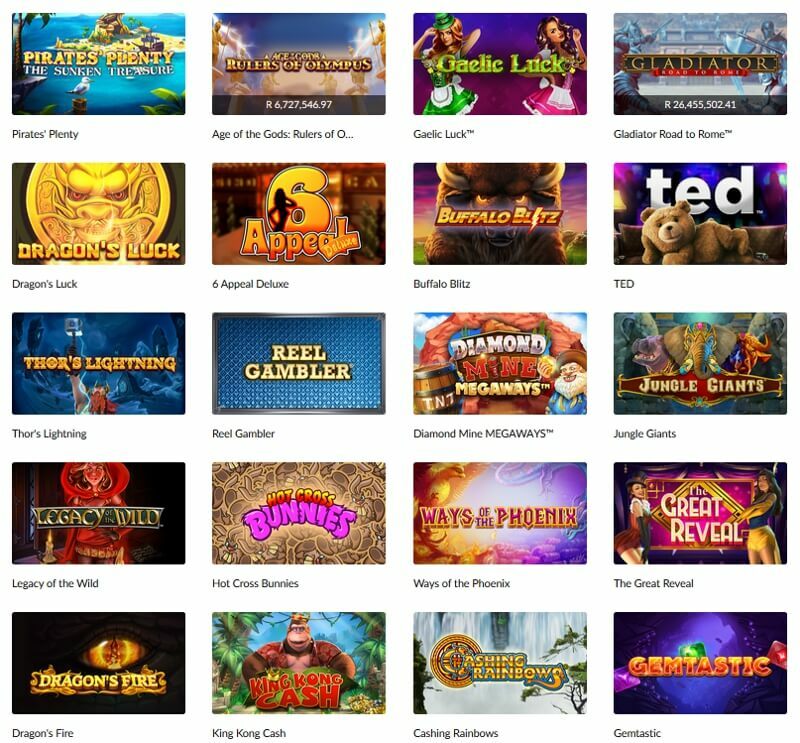 You’ll find a large number of video slots to enjoy at the casino, including Age of the Gods: King of Olympus, Age of the Gods: Ruler of the Sky, Buffalo Blitz, Legacy of the Wild, Tiger Claw, and Dragon of Champions. There are also some progressive jackpot games available too, which include the Age of Gods jackpot series, along with the highly-coveted Gladiator Jackpot, which frequently sees jackpots surpass the $1m figure! There’s a small yet varied selection of casino table games available at Mansion Casino – all powered by Playtech. You’ll find classics like Roulette and Blackjack, along with some newer, less-well-known game variants like 3-Card Poker, and Casino Hold ‘em. Like the slots, all casino games are easily sorted through the game navigational menus, and you can also search for titles directly. Playtech is known for operating one of the slickest and most highly-respected live dealer casinos, and Mansion Casino has decided to utilise Playtech’s experience once more. Playtech’s full range of live dealer games is available at Mansion, and you’ll find multiple variations of Roulette, Blackjack, Baccarat, and Poker game variants to enjoy. There’s also Playtech’s Macau live dealer casino, which allows you to play some Asian-inspired games like Sic Bo. It’s important to point out that Playtech’s live dealer games software is incredibly well-made. Freezing, lagging, or ‘glitching’ is extremely rare, and the live picture is streamed to your computer/mobile device using the latest, securest state-of-the-art technology. The use of this technology allows you to enjoy a seamless, hassle-free online gambling experience. Like most site’s of its calibre, Mansion Casino offers a stellar loyalty program, and you’ll begin to accumulate points from the first time you play with real money. The more points you earn, the higher up their various ladder ‘tiers’ you’ll climb, and this allows you to exchange your points for cash bonuses, free spins, and more. As a new player, you’ll start on the ‘Bronze’ loyalty tier; you’ll then progress through the Silver, Gold, VIP, and Elite tiers. Naturally, the higher the tier you reach, the better the rewards you’ll receive! When it comes to making deposits and withdrawals, Mansion Casino realises the importance of offering their players a variety of options. That’s why, when you play at the site, you’ll find yourself faced with a number of payment methods including Credit Cards, ecoPayz, Neteller, Skrill and EasyEFT. In certain situations, it’s also possible to fund/withdraw to/from your account using a direct wire transfer/cheque, but these are generally reserved for more significant amounts and are more typically used for withdrawals. There are no fees to make deposits or withdrawals at Mansion Casino, and all deposits are credited instantly to your account, ensuring you can begin playing your favourite games right away. The payment team aim to process all withdrawals within 48 hours of a withdrawal request being made. Bear in mind, however, that if you’re a new player, this time-frame may be longer if you’re required to verify your identity and proof of address. Mansion Casino has a dedicated customer support team who are available 24 hours a day, seven days a week, and this allows you to easily and quickly get help and support, should you require it. To get in touch with the team, you simply need to hit the ‘Contact’ button, which is found at the bottom of the site. You will then see a small popup box, which offers various ways of getting in touch. Below, you can view the two most common ways of contacting the team. Unfortunately, there doesn’t appear to be a live chat facility available as of now. The lack of a live chat option is a shame, as it’s undoubtedly the easiest way to get in touch, but still, both methods below are usually relatively fast to receive a response anyway. Mansion Casino is a solid outfit, and they’ve worked hard to built themselves a good reputation over the (many) years they’ve been operating. While it’s a little disappointing that they primarily offer Playtech games, they have started to incorporate more game developers, and you’ll now find a few titles from Betsoft and – more recently – Blueprint Gaming available to enjoy. Withdrawals are processed quickly, there’s a good range of payment methods, and the Loyalty Program can’t be sniffed at – so, if you’re looking for a reputable, reliable, and fair online casino to play at, you can’t go far wrong with Mansion Casino.